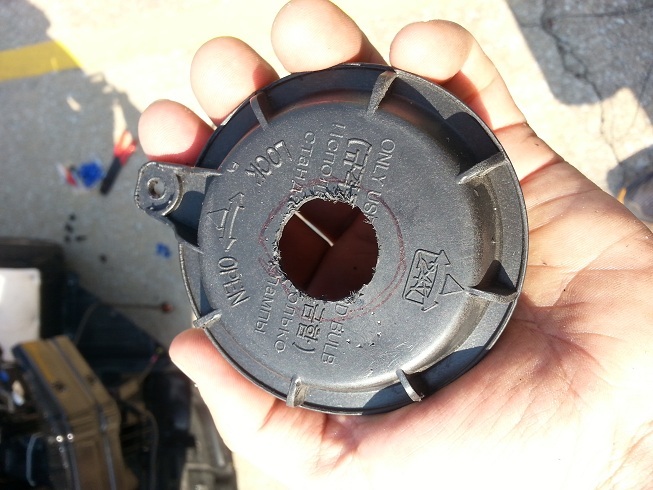 I have seen a walk through or two on here about the HID install, but nothing in detail. Some posts have just pictures, and some are just notes. So I decided to make this one to help others step by step. 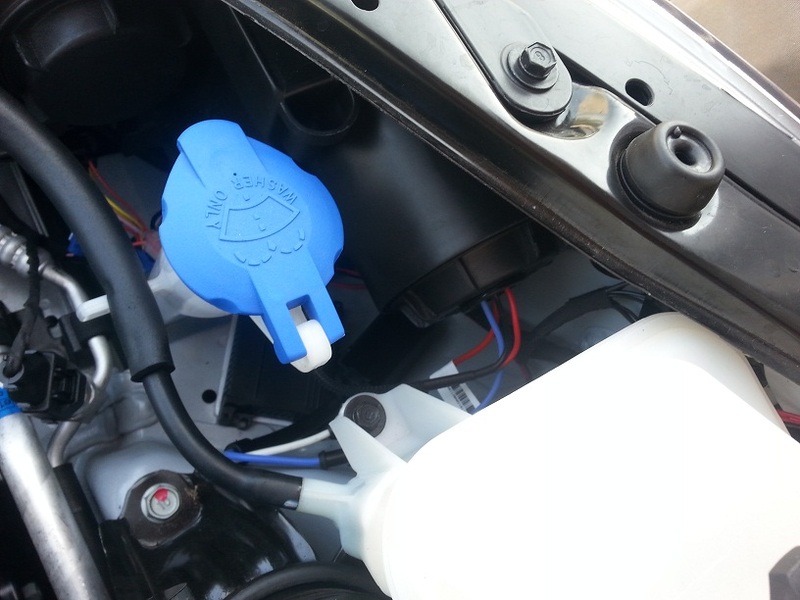 A HID conversion for this car is a relatively quick and easy mod to do for your car. Not only will it change the look of the car by getting rid of that dingy yellow color, but it will increase light output while driving, making driving at night safer. In many states, HID conversion kits are frowned upon, or even illegal because halogen lights have a different beam patter than HIDs. Due to this beam pattern, halogen housings are designed differently, and when HIDs are put in place of the stock halogen bulbs, the light created by the HIDs is undirected and becomes a nuisance for other drivers. Luckily, the new Optimas come with projector headlights which create a cutoff for the headlights. This cut off prevents the light from shining too high and being a distraction. Keep in mind, however, that the halogen projectors are still designed for halogen lights and are, therefore, not the exact same as HID projectors. But these projectors still create a decent cutoff for HIDs, making them, at the very least, better than non-projector conversions. DISCLAIMER: INSTALL A HID KIT AT YOUR OWN RISK. I am not responsible for you getting into trouble because some police officer wants to give you a hard time for the HIDs. Here is a good write up on helpful notes: https://www.optimaforums.com/forum/22...s-1-place.html. In addition, you may be able to find some other write ups or even a video, but as stated before, I haven't seen a complete step by step for this vehicle. NOTE: You do not have to remove the headlights to do this conversion (https://www.optimaforums.com/forum/22...emoval-6k.html), but it may make it easier for you to see and / or reach certain areas. The picture below shows the little room that you will have to work with, and this may be a cause for frustration, headaches, scraped knuckles, and a glorious flood of swear words. I did my conversion when I had the lights removed for another mod. Having the lights out of the car makes this install such much easier. If you choose to go this route, you'll need to remove the front bumper, so this may help you: https://www.optimaforums.com/forum/64...r-removal.html. 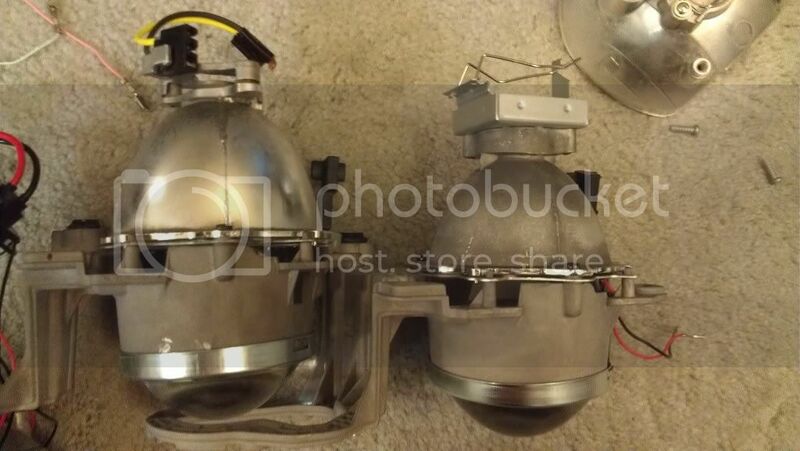 Remove the dust cover from the back of the headlight housing. 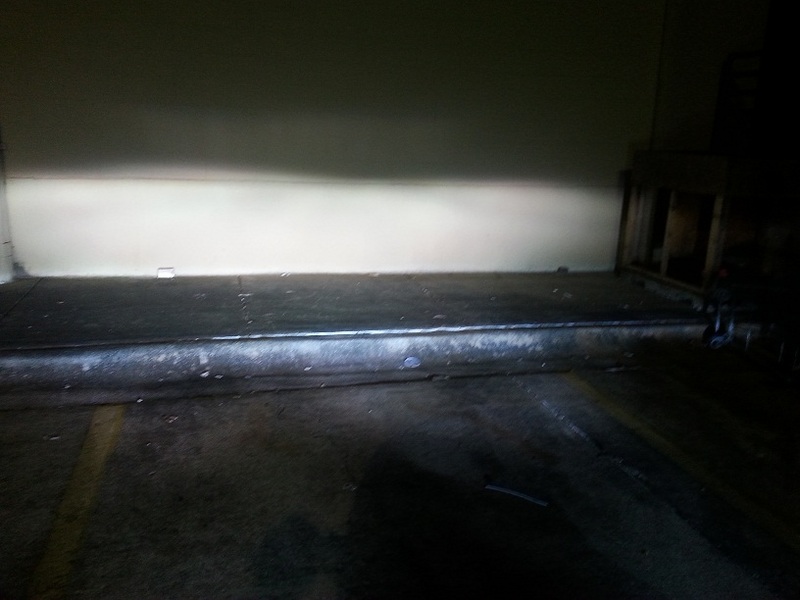 The low beam dust cover is the one closest to the fender of the car. 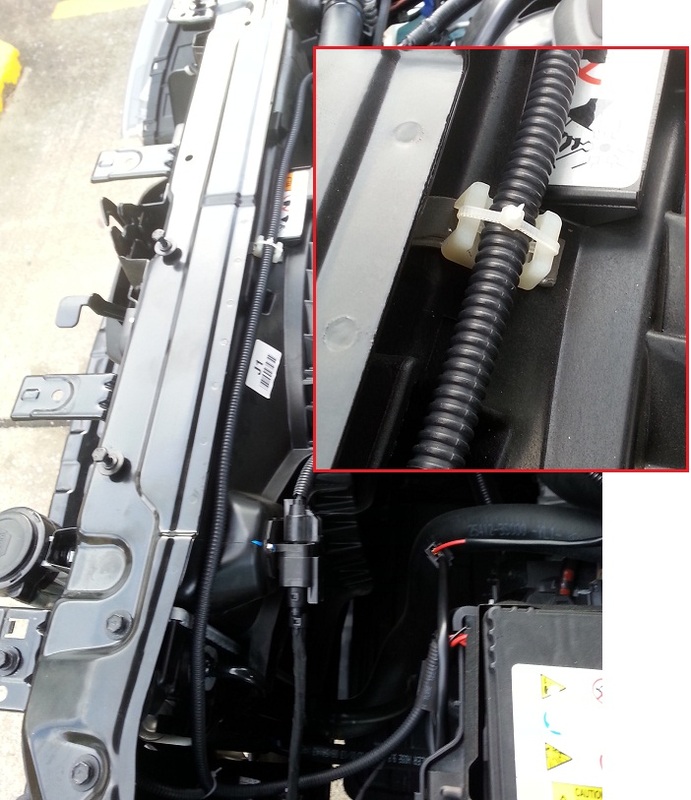 If you look at the picture above, you can see the HID wires protruding from the correct dust cover. Remove the light bulb by twisting and pulling. Take the dust covers and drill a 1" hole in it. This will allow the wires to go through the dust cover, yet remain small enough for the included grommet to cover. Insert wires through dust cover - fill with grommet. Find a place to mount the ballasts. I mounted mine directly under the housing for the drivers side, and directly behind the housing for the passenger side. Just make sure that you mount it on a clean, flat surface. If mounting vertically, I HIGHLY recommend securing the ballast with more than 3M tape - I used 3M double sided tape (provided with most kits) + zip ties. Insert plugs into the housing wires - the plugs look like little prongs and will insert directly into the housing coupler. At first I was a bit skeptical that the wires would stay put, but after playing with it for a while, I found that it's fairly secure. You would have to hit multiple pot holes extremely hard for these prongs to simply fall out of place, in which case I feel you would have bigger problems than your lights not working. Black wire from light goes to black wire in the coupler. Red wire from light goes to yellow wire in the coupler. If you ARE using a relay: repeat steps 1-5 for the opposite side and continue to step 7 (step 6 is NOT required for both headlights if you are using a relay). If you are NOT using a relay: repeat steps 1 - 6 for the opposite side, and continue to step 8. !!! IMPORTANT NOTE: I had read that a relay is required, but I ran out of time when doing the install and decided to not do the relay. The kit worked fine... for about 2 days. Then the lights didn't want to power on. The day after I had to drive home with my brights on, I installed the relay. Needless-to-say, I RECOMMEND THE RELAY, but you can attempt no relay if you'd like. Connect black ground wire to a good ground point. https://www.optimaforums.com/forum/22...s-1-place.html explains why you should not connect to the negative terminal, but if you choose to do it, I can't stop you. There is a nice ground point directly in front of the battery - this ground is NOT the same ground point that the battery's negative terminal is connected to (see picture below). Connect red power wire to positive terminal of battery. CAUTION: https://www.optimaforums.com/forum/22...s-1-place.html says that this is a bad idea, and gives an alternative suggestion for power. However, I haven't had an issue. That's not saying that there won't be an issue by using the battery directly, I'm just saying that I haven't had one. Choose a power source you are comfortable with. 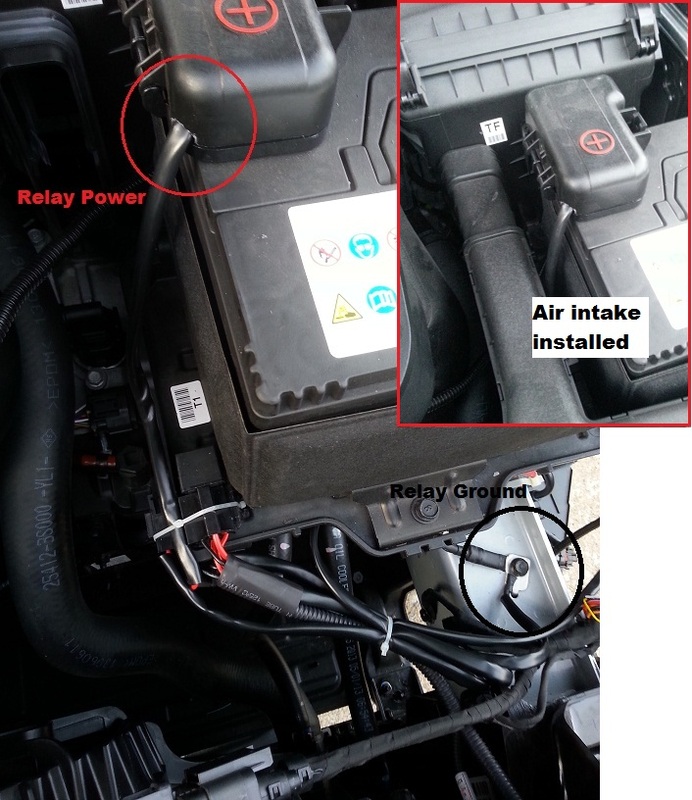 Mount the relay and fuse, or find a good place to tuck them away. 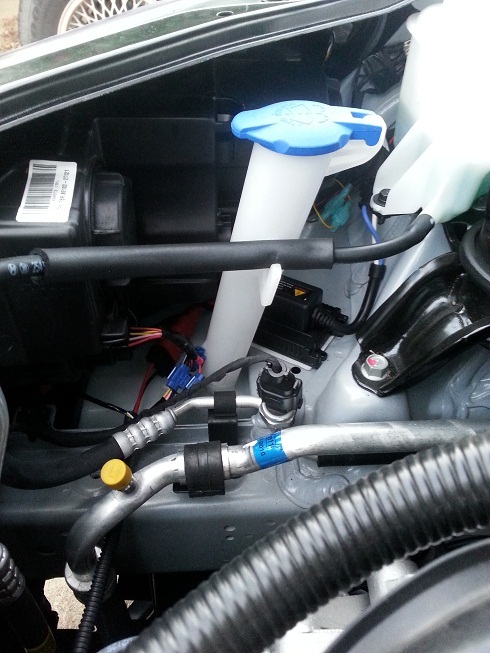 I mounted mine beside the battery - it's far enough away from the engine and a clean mounting point. There are also a couple holes available (you may have to enlarge one) so you can securely mount the relay and fuse together. I used both 3M double sided tape and a zip tie. Plug powered plug (from step 6) into relay harness, then connect relay harness to both ballasts (red port on ballast) lights. 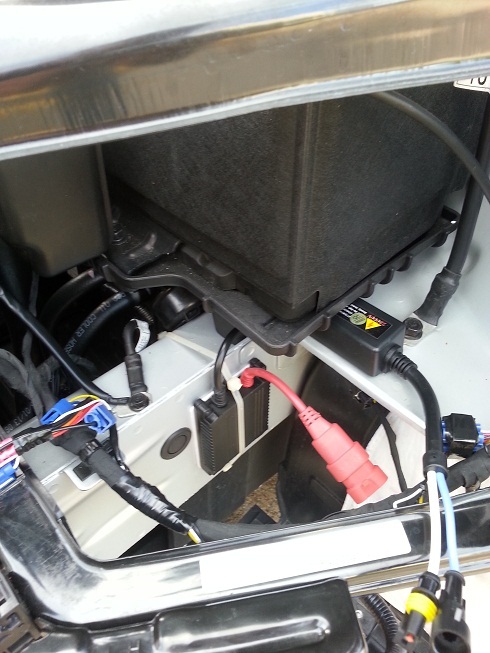 Plug HIDs into ballasts (circle ports). Plug powered plug (from step 6) into ballast (red port on ballast). 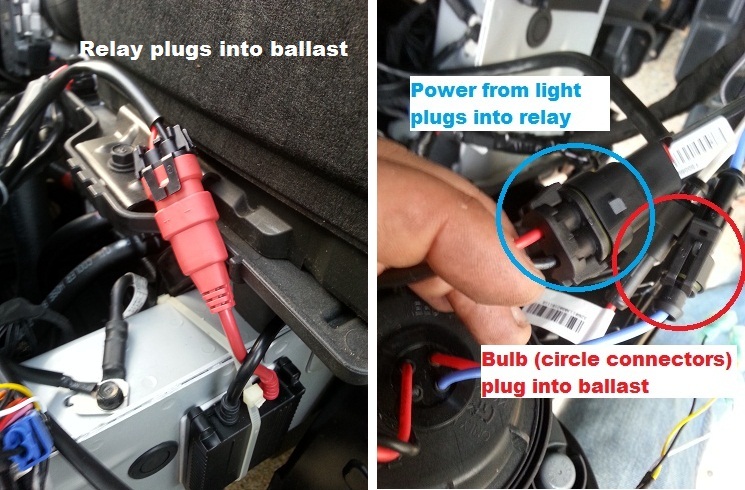 Then plug HID light into ballast (circle ports). (See above picture). Repeat on opposite side. Clean up wires, put car back together, and go light up the road. (My car was slightly crooked when I took this picture, thus the higher angle on the driver side - but it gives a general idea of the cutoff... I think it's pretty good for non-HID projectors). You are absolutely correct, your projectors are not designed for HID, but compared to many other halogen housings, our projectors are not to bad with HID. Another thing id like to add is that if you are doing this withought removing the headlights you will have to remove two 10mm bolts holding the coolant tank down and move it to the side so you have room to work on the passenger side. Thanks for the tip on the coolant tank. As for the spade connectors, you can twist or end them ever so slightly so they don't move at all... I didn't add this to the write up cause I didn't want people to twist the crap out of the spades and then blame me for telling them to do it. LoL. But twisting or bending them just a little will keep them in place pretty snug. But for real, I didn't realize that the HID projector was so much smaller. Wow this is a great DIY.. Thank you again for taking your time to make these..
Mods could we get this stickied by chance? I think it was stickied already, but I could be wrong. I'm glad you like them. I'll be making more for sure. Great write up. I need to get on this and get these done.